Fleetwood Mac’s has cancelled their appearance at the New Orleans Jazz Fest and postponed 4 of their North American tour dates. Mick Jagger’s doctors have advised him to postpone the Rolling Stones’ North American tour for health reasons. Peter Frampton opens up about Finale the Farewell Tour with Jason Bonham’s Led Zeppelin Evening and why it will be his last tour. Rumors are swirling about a 2019 Van Halen tour featuring the original cast. Could a Rolling Stones Tour be in the Works? 11/07/2018	Music News, Top Stories Comments Off on Could a Rolling Stones Tour be in the Works? After teasing new music for months, US stadiums are hinting at a possible Stones tour. Fleetwood Mac gave a sneak-preview of their new lineup with a performance on The Ellen DeGeneres Show. 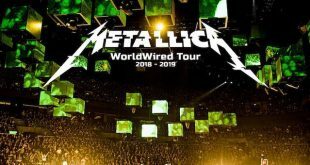 Metallica’s Worldwide Tour just announced their North American tour dates- and they’re coming to Missouri!! Chicago and REO Speedwagon are joining forces this summer for a co-headlining tour of North America. John Fogerty announces a new album in the works and the reissue of five of his solo albums. Lynyrd Skynyrd is coming to Hollywood Casino Amphitheatre Saturday, August 18 on their Last of the Street Survivors Farewell Tour.